I was looking to see if more people had reusable bags in San Francisco. Not sure if I noticed more than usual, but I did see some cool ones. The flip and tumble bag rolls into a little ball and then pops open for use. 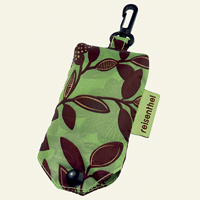 I like these Reisenthel bags that smoosh down into little pouches and snap onto your keychain. I have this keychain style bag from the Container Store. It's fantastic. It's so small in your purse and it's surprisingly roomy when open. I always like bags like that, but they seem so impossible to get them back into their small state when you're done using them. I carry the Envirosax. Love them and they are pretty stylish. I have one of the flip and tumble bags. It is really easy to compact and I use it all the time. I would definitely recommend it for everyday use. I got both my Envirosax bags from Parkleigh. They had a bunch last time I stopped in there. My favorites are the Chico Bags - similar idea, easy to stuff them back in their little pouches. And when they are stuffed, they look like Barbie-sized sleeping bags. Olive Smart bags (s/6) are great -- and the cashiers love stuffing them.